The annual Wilderness Beach Festival, hosted as its main fundraiser by Wilderness Sea Rescue, will again take place this year on Wilderness Main Beach from 13 - 14 December 2014. The event promises to live up to the expectations of a fun filled weekend of activities for young and old, the adventurous and not so adventurous. 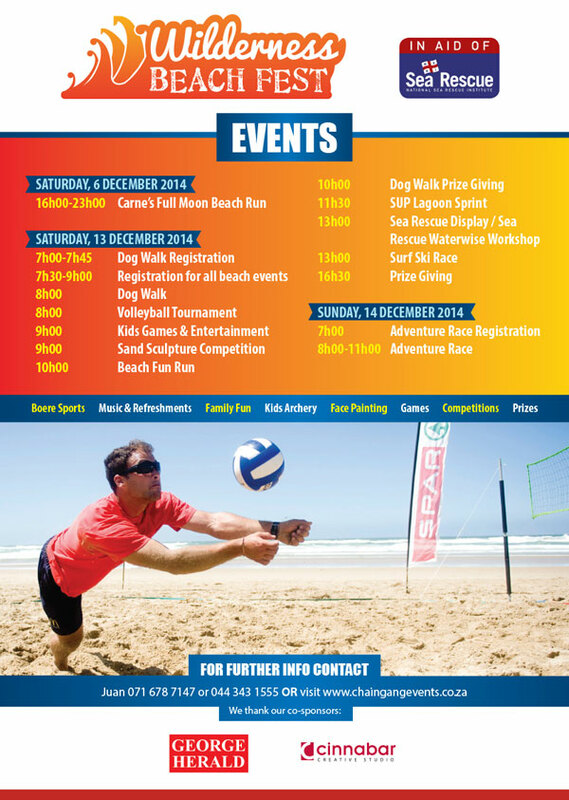 On Saturday, 13 December, the core attraction is the very popular Beach Volleyball Tournament, with up to 32 teams playing it out for the sought after title of Wilderness Beach Volleyball Champions. Other attractions include a Beach Fun Run (3km & 9km), Sand sculpture competition, Dog walk on the Beach (with prizes like best young dog, owner-dog similarity, etc and a goody bag for each entrant) and plenty and varied entertainment and competitions for the little ones like face painting, boere-sports, egg-throwing competition, sack races etc. Other activities includes a 7,5km SUP sprint up and down the Touws River, and an ocean Surfski race, finishing on the Main Beach. During the lunchtime break, the Sea Rescue crew will demonstrate a rescue training scenario, followed by a Water Wise talk on the dangers of rip currents and other water dangers. A very festive atmosphere is created by music being played through the day, together with enough food and refreshment stands, to cater for everybody. The festival area on the beach is decorated in an array of colourful volleyball courts, banners, flags and tents. On the Sunday, a mini adventure race is scheduled in and around the Wilderness area, starting and finishing at the main beach in Wilderness. Everyone is welcome to join in the fun, and entrance to the Beach Festival area is free of charge.